Hi, I am wanting to do x4 table centerpieces for my daughter's birthday. Will a tower of 5" latex balloons hold a 24" foil on top? Thanks in advance for your help, Lauren. You are planning to do your tower with air-filled balloons and without a balloon stand, right? Yes, these mini balloon towers are sturdy enough to hold a 24 inch foil balloon. The trick is to add a weight to the bottom cluster of balloons. The weight can simply be a water or sand filled balloon. 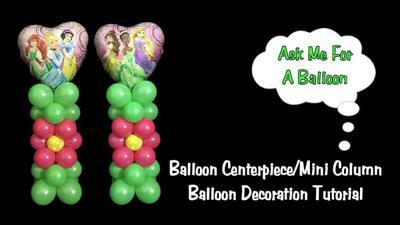 This video by Tanya from "Ask Me For A Balloon" shows you step-by-step how to create your 5 inch balloon columns. Have fun with decorating your daughter's birthday!